Aerial Yoga is an exciting style of practice that has grown tremendously in the South African yoga community. The combination of weightlessness, powerful strength and beauty allows you to learn more about yourself, and discover a new, fun way to increase strength and flexibility. We got in touch with Simmi Fink, aerial yoga instructor and owner of hOHM Yoga Sanctuary in KwaZulu Natal, to hear all about the benefits of introducing aerial yoga into your practice! Simmi grew up in Dancing classes & gymnastics, and always loved the idea of a ribbon or some kind of beautiful prop to use. When she fell pregnant, the idea of using fabric from the ceiling to have something to pull on sounded helpful. Thats when her love for aerial yoga began! After having her baby, she was delighted at how quickly her body adapted to being back in the hammock. “I felt like a dancer, a yogi, and a gymnast all in one.” said Simmi, “It was liberating!” Aerial Yoga has since become a regular offering at hOHM Yoga Sanctuary classes and retreats. So what is aerial yoga? 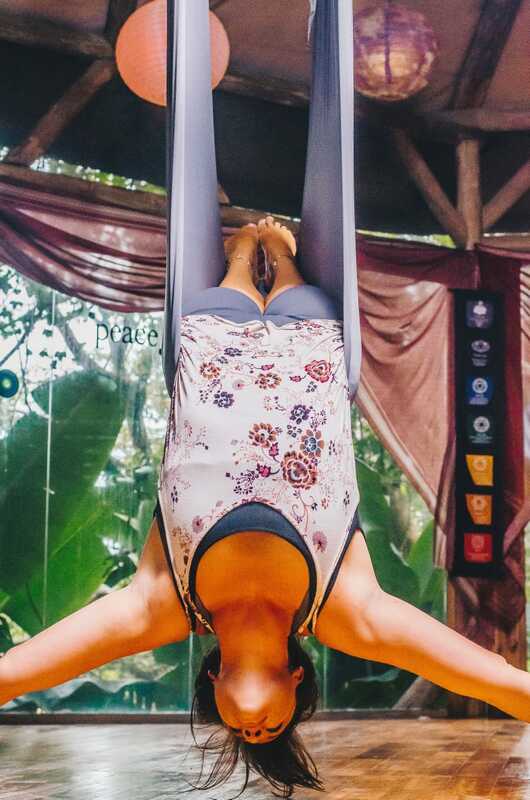 Aerial yoga is a type of practice that makes use of a hammock to allow students to perform specific yoga postures with additional support from the swing. Therefore, allowing students to try new postures that they might not necessarily be able to do on a yoga mat. What originated in New York, is now popular all over the world and is becoming increasingly popular in South Africa. Aerial yoga has a strong decompressing effect on the body and is said to be most beneficial for people who sit for long periods of time. Additional benefits of aerial yoga include realignment of the spine, helping to reduce back pain and sore muscle, improve the digestive and lymphatic system as well as increase of musclular strength. Aerial Yoga offers you the opportunity to get into new poses, feel into your body differently and so have little “aha” moments as gravity holds you differently. “You can do inversions, like shoulder and head stand, without the added pressure on you head and neck, and so really explore your body in new ways.” says Simmi. “It is beneficial to practice both with and without the fabric, and having an established practice of both will boost your practice in all areas. When asked what she loves most about aerial yoga, Simmi responded with “ the delicious savasana in the hammock” going on to explain that at the end of a class, she almost feels taller after stretching out her spine. That, combined with the uplifting feeling of doing things you never thought you could do, is unbelievable. “One of the biggest thing is trust.” says Simmi “You really have to learn to trust yourself, to trust the fabric, to trust gravity.” Although classes can be challenging for some, others catch on quite naturally. Either way, there is almost always a transformation experienced through students who learn something new about themselves or gain confidence in this new skill! hOHM Yoga Sanctuary have now started their own SA Yoga hammock supplies so you can get all the equipment you need to start your aerial yoga practice at home or at your studio. “Sometimes at the end of the day, you havent made it to the yoga class you” says Simmi, and thats where having your own aerial yoga setup is a treat. “There is nothing better than an early morning quick inversion to get you ready to face the day ahead with joy, or late night session to get your body ready for a deep, relaxing sleep.” explains Simmi, going on to explain that there are many simple ways to use the fabric, and get a good stretch, without needing to think about what to do next. Plus, it is also a great way to chill out and read a book, or to fully relax and shut off the world around you when you use your hammock in the traditional sense. Being a mom of two, Simmi loves how her kids enjoy it too! You can hang the fabric on a tree, take it to your next holiday destination, or put your new baby to sleep in it. and it also turn it into silks (using 2 long pieces instead of the hammock) It is really quick and easy to set up, and anyone can do it! Taking your yoga practice to the next level with Casey Chiang.